After new PUMA Thunder Spectra and Air Max 1 x Air Jordan 1 designs, the Shoe Surgeon has revealed a new “All Hallow’s Eve” design just in time for Halloween. Taking on the Air Jordan 1 silhouette, the new design takes influence from the Off-White™ x Nike Blazer “All Hallow’s Eve” that released earlier this year. 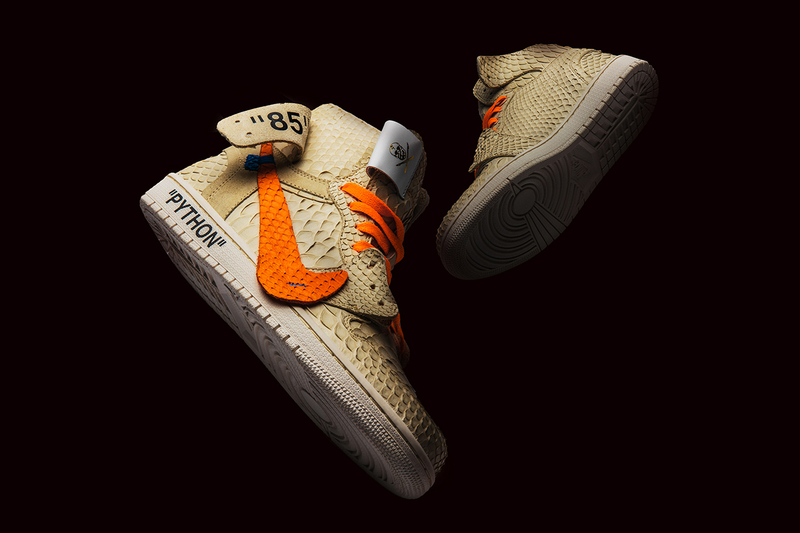 The sneaker comes with a cream python upper, complete with python Swoosh in orange. As well as signature Off-White™ x Nike touches — including an oversized Swoosh extending onto the midsole and quotation marks — the sneaker also features a leather Shoe Surgeon tongue tag and Japanese plonge leather lining. The silhouette will release via the Shoe Surgeon web store on October 27, with each pair priced at $3500 USD. In other footwear news, the Off-White™ xNike Blazer Mid “QUEEN” accidentally released as an Android exclusive. With three new billboards in Tokyo. KVA teases us with Berluti’s latest capsule.